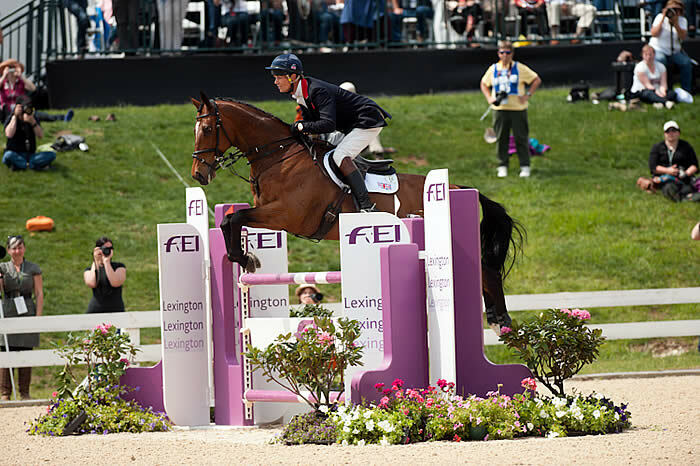 Lausanne (SUI), 29 April 2012 – William Fox-Pitt (GBR) won his 11th CCI4* and yet another prized Rolex watch when he held his nerve in the tense final minutes of the Rolex Kentucky Three-Day Event (USA) presented by Bridgestone, the third leg of the HSBC FEI Classics. Fox-Pitt, the leader after Cross Country on Catherine Witt’s talented New Zealand Thoroughbred Parklane Hawk, appeared to have been handed a lifeline when overnight runner-up Allison Springer (USA) and Arthur hit a rail, but then Parklane Hawk had one down as well and Fox-Pitt was left with no margin for error. But the current leader of both the HSBC FEI Classics and the HSBC Rider Rankings is famed for keeping calm in a tight situation. And Fox-Pitt will certainly need to draw on those renowned reserves of cool this week for he now heads to Badminton in the tantalising, yet pressurised, position of having won two out of three legs of the $350,000 Rolex Grand Slam. This elusive prize, to the rider who can win Kentucky, Badminton and Burghley in succession, has only been won once before, by Pippa Funnell (GBR) in 2003. “It’s a fantastic position to be in. I’ve never managed to win two CCI4*s in a row until now, let alone three! I think it may be quite unlikely, but we will see!” said Fox-Pitt, who rides Neuf des Couers and Seacookie at Badminton next weekend. Karen O’Connor (USA) kept her hopes of a sixth Olympic Games alive with a great clear round and fourth place on new ride Mr Medicott. She finished on an equal score to Martin, but his faster Cross Country time prevailed. Will Coleman (USA) completed a great weekend by finishing on his Dressage score on Twizzel in fifth, but Jonathan Paget (NZL) slipped three places to sixth on Clifton Promise with two rails down. Paget’s fellow New Zealander, World bronze medallist Andrew Nicholson, riding the exciting young Spanish-bred mare Qwanza, rose quietly from 24th place after Dressage to seventh, with no further penalties added. This earned him enough HSBC FEI Classics points to propel him into second place on the leaderboard, following his second place at Pau (FRA) last year. Like Fox-Pitt, Nicholson has two good rides – Avebury and Mr Cruise Control – for Badminton where the next stage of the HSBC FEI Classics action takes place. Marilyn Little-Meredith (USA), who so impressed with her two clear Cross Country rounds, won the HSBC Training Bursary worth $1,000 for the best CCI4* debut. She finished ninth on RF Demeter, having slipped a couple of places with three rails down. Little-Meredith, who has won at CCI2* and CIC3* level, only made the career switch from Grand Prix jumping to Eventing two years ago. She is helped by David and Karen O’Connor. Her other ride, RF Rovano Rex was 10th after Cross Country but was one of four horses withdrawn before Jumping. In 2010, Little-Meredith won two classes at Spruce Meadows CSI5* on Blue Curacao. William Fox-Pitt has won 47 CCIs, including 11 CCI4*s: Badminton (2004), Burghley a record six times (1994, 2002, 2005, 2007, 2008, 2011), Luhmühlen (2008), Kentucky twice (2010 and 2012) and Pau (2011). He is the only rider to have won five out of the world’s six CCI4*s.
He has also represented Britain 15 times in championships, winning Olympic silver (2004) and bronze (2008), world team gold and individual silver on Cool Mountain (2010) plus team silver in 2006 and team bronze in 2002. He has six European team gold medals, team bronze and two individual silvers (1997 and 2005). Fox-Pitt, 43, is married to Alice, a racing commentator on television. They live in Sturminster Newton, Dorset, and have two young sons, Oliver and Thomas. At the centre of HSBC’s sponsorship is a commitment to the development of Eventing at every level. As part of their support of the HSBC FEI Classics, HSBC has introduced a Training Bursary. This is a unique award which is presented to the highest placed rider ever to have completed a 4* event prior to 1st January 2011. The winning rider receives a training voucher to the value of $1,000, which is spent on sessions with a trainer of the athlete’s choice approved by FEI and National Federation. Further information can be found here: http://www.fei.org/hsbc/hsbc-training-bursary. Full leaderboard can be viewed here. To view the HSBC Rankings please click here.